Sergeant Major, Cape Police District II. 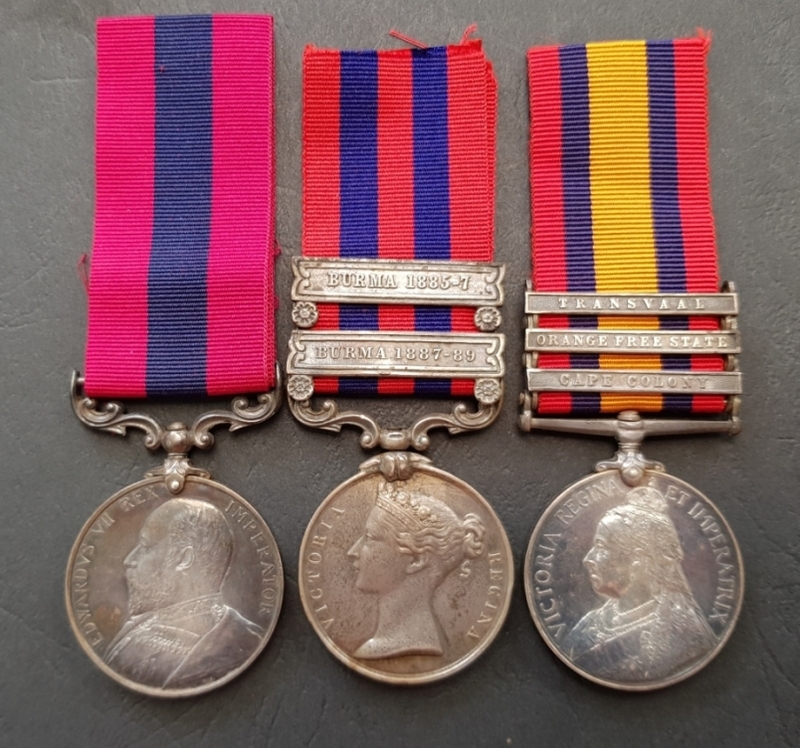 -	India General Service Medal (1854) with clasps Burma 1885 -1887 and 1887 – 1889 to 1008, Pte. R.G. Sterling, 1st Bn. York L. I.
Robert Sterling’s (or Stirling as he was sometimes mistakenly named) story is a tragic one. It is a story of a man who was a Prisoner of War, a man Severely Wounded in action and a man who was to be rewarded for an act of gallantry; all rolled into one. Was this combination of events what led him to take his own life just after receiving the ultimate accolade? Born in Waterford in Ireland on 7 December 1868 he was the son of Robert George Sterling and his wife Mary (born Clydesdale). Robert senior would appear to have been in the service of the Army, passing away at an early age in India in August 1873 when Robert was a mere 5 years old. Left to her own devices and with a young child to raise his mother, Mary, went on to marry a Henry Jolliffe in Ramptee, Bengal, India on 2 March 1874. Henry was to play a pivotal role in the life of his young stepson and was himself a soldier in the service of the Yorkshire Light Infantry – a role-model for his stepson to emulate. Spurred on by his step-father Robert enlisted for Long Service with the Colours at Dinapore, India on 16 January 1884. At the time he was 15 years and 2 months old. His Attestation papers when joining the South Yorkshire Regiment were witnessed by Henry Jolliffe, Sergeant. Physically, as can be expected of one so young, Sterling was 5 feet 2 ½ inches in height weighing 111 pounds. He had a fair complexion, brown eyes and light brown hair. By way of distinguishing characteristics he had a mole on his left shoulder and a wart on his nose. Having been passed as Fit for the Army Sterling was granted no. 1008 and the interim rank of Boy. He was to serve with this status for 2 years and 304 days before attaining the age of 18 and with it the rank of Private, on 15 November 1886. Almost immediately after enlisting he was thrust into the cauldron of war, on this occasion the Third Anglo-Burmese War, also known as the Third Burma War. This was a conflict that took place during the period 7 to 29 November 1885, with sporadic resistance and insurgency continuing well into 1887. Lasting only three weeks, it was the final of three wars fought in the 19th century between the Burmese and the British and one which saw the loss of sovereignty of an independent Burma under the Konbaung dynasty, whose rule had already been reduced to the territory known as Upper Burma, the region of Lower Burma having been annexed by the British in 1853, as a result of the Second Anglo-Burmese War. The Burmese Resistance Movement of 1885–1895 occurred almost immediately after the fall of Mandalay. Due to the rapidity of British advancement up the Irrawaddy River, the bulk of the Burmese army suffered few casualties. Many had not experienced actual fighting. Nevertheless, the issue of the Hluttaw’s order to surrender on 27 November 1885 meant that Burmese garrisons south of Mandalay had to disarm without putting up a fight. Soon widespread resistance started to break out in Upper Burma, Lower Burma, the Shan Hills, Kachin Hills and Chin Hills which did not die out until 1896. It was during this period of resistance that Stirling served. On 26 August 1890 he reverted to the rank of Private at his own request and, on 24 November 1890, was transferred to the Army Service Corps to take up duty with the 18th Company, A.S.C. and with no. 9724. A series of promotions followed; first to Lance Corporal on 17 September 1891 and then to 2nd Corporal on 15 March 1893. He was promoted to Corporal on 8 March 1895 and then to Sergeant on 12 July 1895, some four months later. All told, he had served in India from the date of his attestation, 16 January 1884 until 20 December 1887, a total of 3 years and 339 days. 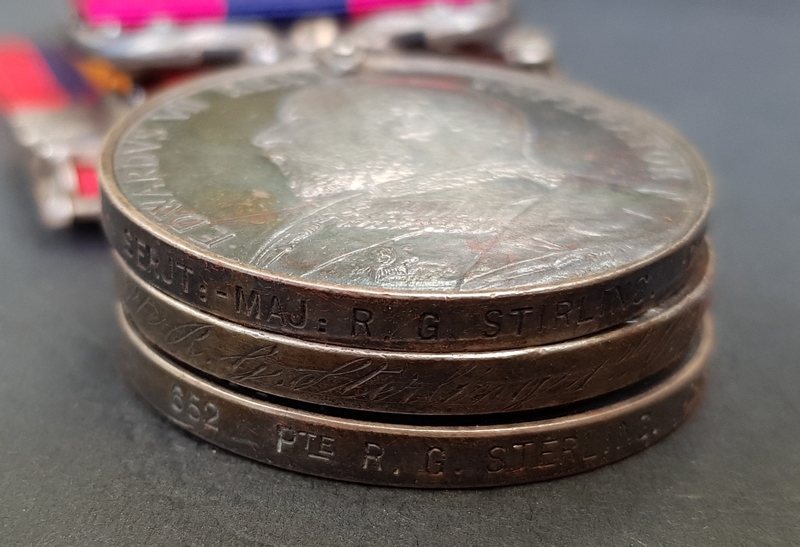 Sterling, after service in India, had been sent “Home” to England where he was to be stationed until 5 June 1893, a period of 5 years 167 days. The 1891 England census has him at the Aldershot Barracks in Hampshire on the night of 31 March. From there he was transferred to South Africa serving at Cape Town from 6 July 1893 after a month long voyage aboard H.M.T. “Jamar”. Whilst there he was re-engaged for the A.S.C. on 1 November 1895 for “such term as shall complete 21 years service.” He was discharged at King William’s Town in the Eastern Cape with the rank of Sergeant on 12 August 1898, free after 14 years service under Article 1142 of 1897. His conduct on discharge was regarded as Very Good. An analysis of his Medical Record indicated that Sterling spent 13 days after enlistment in Dinapore in hospital with Haemorrhoids occasioned by constipation. Up until June 1886 he was to be hospitalised and treated for a variety of ailments, primarily Diarrhoea, incontinence of Urine and Bronchitis all of which had their origin in either the climate or constipation and for which a variety of remedies were offered. Having arrived in Burma on 28 October 1886 he suffered with Cystitis for a period of eight days. Once in England he was hospitalised at Gosport on Christmas Day 1887 with Ague (Fever) for which he was treated with Quinine. Stationed at Aldershot from 26 August 1890 Sterling was treated for an Ulcer in March 1891 before, like so many of his comrades, succumbing to the temptations of the flesh which led to a dose of Syphilis in 1891 which saw him hospitalised with severe contagion for 45 days. He must have been relieved to be discharged on Christmas Day 1891. The reason for Sterling’s discharge from the A.S.C. became apparent almost immediately with the completion of Candidate’s Papers for the Cape Police on 3 September 1898, a mere 3 weeks after discharge. By this time he had made his way from King William’s Town to Kimberley which is where he attested for service. Kimberley was a boom town - with the discovery of diamonds and the presence of Cecil John Rhodes and his cohorts to boot the place was a veritable hive of activity. His papers revealed that Sterling was now 29 years old and an Irish national. He confirmed that he had been a Soldier in South Africa for the past 5 years and 2 months and, in answer to the question as to why he had resigned or been dismissed from his previous situation he replied that he had “resigned to better myself”. Having taken the Oath of Allegiance he commenced employ with the Cape Police District, headquartered in Kimberley, with no. 652. Unbeknown to Sterling war clouds were gathering with alarming speed between the Transvaal and Orange Free State Republics on the one hand and the might of the British Empire on the other. 11 October 1899 saw the final eruption into full scale war taking place. Sterling was, as has been noted, already in the employ of the Cape Police, a para-military outfit which was required to take up arms against the Boers as well as fulfil a myriad of other policing duties simultaneously. That he was to have an active war was soon evident – at some point he was taken Prisoner by the Boers and, along with thousands of other men – both Imperial and Colonial – was incarcerated in the notorious Waterval camp - a farm which gave its name to a railway station on the Pretoria-Pietersburg railway line in the South African Republic some 20 km north of central Pretoria – that the Boers were woefully unprepared and unschooled into what was required to run a P.O.W. camp soon became obvious. Conditions were unsanitary, the food inadequate and there was no activities designed to relieve the boredom and drudgery of the men’s’ daily lives. According to the official records a squadron of the 2nd Dragoon Guards emancipated the camp on 6 June 1900 although it is not known for what period of time Sterling had been there. There were 3,187 prisoners released that day. A train was sent to collect them and take them back to Pretoria, but the train was not able to carry all of the men and most, thousands of them, walked the thirteen miles into Pretoria. The men were so weak and exhausted, that it was almost three weeks before all had been accounted for. Most were accommodated for the while in Pretoria in a ‘Prisoner’s Camp’ and were issued rations of Bully Beef, biscuits and vegetables. 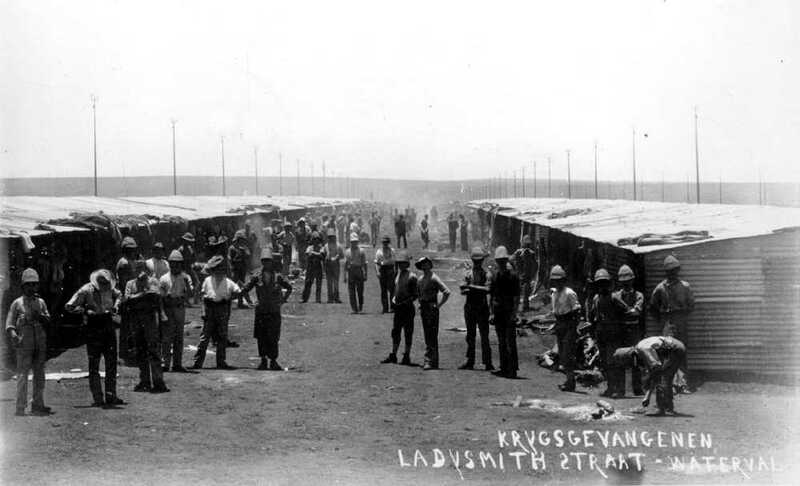 The next morning Kitchener himself visited the camp and assured the men of proper clothing and as much food as possible as soon as practicable. In the afternoon Lord Roberts came and inspected the men. 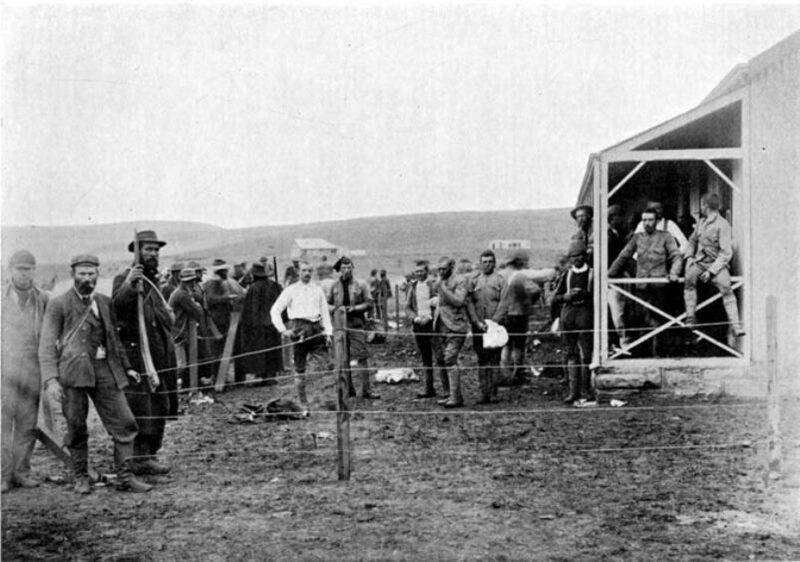 Three Courts of Enquiry were held at Pretoria Artillery Barracks over three days, where prisoners were interviewed and held to account for their capture. Where an officer was captured, he answered for his men as well as himself. On their release, most rejoined their regiments in due course, but some took to hanging around the streets drinking until rounded up by the temporary Police force. Sir Arthur Conan Doyle wrote of the event “Many pieces of good luck we had in the campaign, but this recovery of our prisoners, which left the enemy without a dangerous lever for exacting conditions of peace, was the most fortunate of all”. Sterling wasn’t the type to hang about the streets in a drunken stupor – he rejoined the Cape Police and continued to take the fight to the Boers who, by this time, had abandoned conventional warfare and had adopted guerrilla tactics – hit and run attacks by small but highly mobile commandos who harassed the British lines of communication and pounced on small British patrols. On the evening of the 15th a column numbering 250 consisting of Cape Police, the Mounted Town Guard and two guns of the Royal Field Artillery, left Vryburg and reached Zoutlief in a storm of wind and rain. The next morning the column encountered a party of the enemy, of whom two were captured and two wounded. The mounted men proceeded to Thanet and found the Boers in strength. A hot engagement then ensued. The Boer’s who comprised Van Zyl’s and Van der Merwe’s commandos, and who were 400 strong, took up a position covering a house which appeared to be the enemy’s headquarters. The enemy were shelled vigorously but a number of shells failed to explode in consequence of the heavy rain of the previous night. Sterling was recommended together with Lieutenant Gash and Privates’ G. De B. Lewis and J.A. Ives. The award of the Distinguished Conduct Medal, second only to the Victoria Cross for bravery, appeared in the London Gazette of 17 January 1902. Despite being a hero Sterling’s life and career continued unchanged. The end of the Anglo Boer War on 31 May 1902 saw him resuming his policing duties in the Vryburg area of the Cape. He was awarded the Queens South Africa Medal for his service with clasps Cape Colony, Orange Free State and Transvaal. 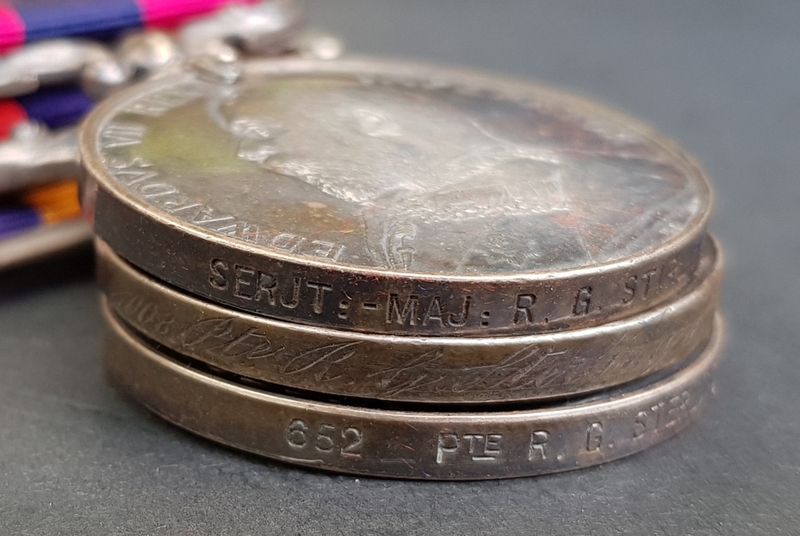 (The Kings South Africa for which he was eligible was, according to a note on the medal roll, issued on 19 December 1906 to the Commandant, Maritzburg, Natal (to go to step father, Mr. Jolliffe.)) It is not known if it was ever received. The end of the war found Sterling still in uniform and resuming his normal policing responsibilities. From Vryburg on 26 August 1903 he wrote requesting that his application for discharge from the Cape Police which expired on 3 September that year, be withdrawn. The next day, on 28 August 1903, the Commissioner of the Cape Police wrote to the District Inspector, Bechuanaland, Vryburg asking if Sterling was prepared to re-engage for a further period of 3 years to which the reply, on 1 September, was “Yes”. 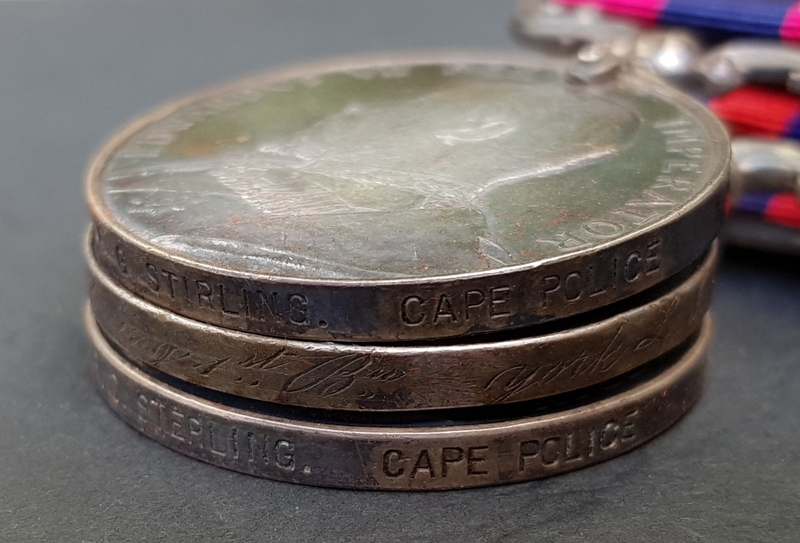 On 9 September 1903 Sterling formally requested re-engagement with the Cape Police. At Kimberley the Police Surgeon, J. Mathias, M.R.C.S. certified that he had examined Sterling and found him to be sound and in good health and physically capable of performing the duties of a member of the Cape Police District No. 2. Physically he was now 5 feet 7 inches in height with good hearing and good eyesight and had, no doubt recovered from his hospital stay. With the small matter of his continued service out of the way Sterling faced a certain future. Sadly it was not to be. Robert George Sterling passed away by his own hand at Myssymyani Redwater Cordon Camp (District Vryburg) on 11 November 1903. Whether occasioned by continued poor health as a result of his wounds or through depression, one will never know why he took his own life and came to such an ignominious end. He was 34 years and 11 months old at the time. So ended the life of a decorated man forgotten until now when those who read this remember him with honour. A very sad story, Rory, but it is fantastic that his life is recorded in such detail and preserved now for posterity. Might there be a chance that he was with the Cape Police that were captured at Kuruman ? He is not on the list of the 32 C.P men who helped to defend Kuruman during Nov/Dec 1899 and is not mentioned either when they surrendered to Cmdt Visser and his group of approx 400 Boers on the 1 Jan 1900. Part time researcher of the Cape Police and C.P.G Regiment. What were the names and numbers of the 32 Adrian?